The project IMPACT2C (Quantifying projected impacts under 2°C of warming) utilizes a range of models to assess the effects of climate change on water, energy, infrastructure, coasts, tourism, forestry, agriculture, ecosystems services, health and air quality-climate with a particular emphasis on the internationally recognized 2 degrees global warming target. Harmonized socio-economic assumptions and scenarios ensure that both individual and cross-sector assessments are aligned to the 2°C scenario for both impacts and adaptation. GCF uses the DIVA model to evaluate sea-level rise impacts with a a special focus on the Maledives. Towards this end new data is being collected, including island elevation and population changes. Furthermore, drivers and pressures of coastal changes, together with adaptation options are being assessed. The project IMPACT2C is funded by the European Commission’s Seventh Framework Programme (2007 – 2013), under the grant agreement number 282746. Figure 3. 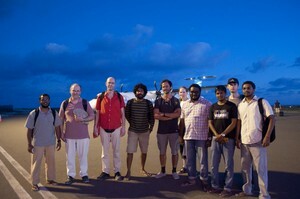 Group from GCF, Southampton University and Ministry of Environment of the Maledives at a field trip to Dharavandhoo. The Maldives comprise 1,192 low-lying coral atoll islands in the Indian Ocean spread over 298 qkm, with elevations typically within 1.5m above mean sea level. 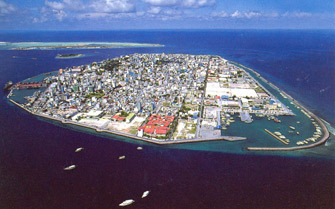 198 of the islands are inhabited, with one third of the total population (about 300,000) living in the capital Malé (Figure 1), which has a population density of 50,000 people / qkm. The islands are dependent on tourism and fisheries. With global mean sea levels rising, there are concerns regarding how the islands will adapt and cope with extreme water levels. Today, coastal flooding already occurs, and coastal erosion is observed in 60%-70% of the islands (Figure 2). In order to respond to these threats the island’s engineers employ a mix of soft (e.g. nourishment) and hard engineering methods (e.g. bulkheads, breakwaters, revetments, groynes, drainage, pumping). Another response is land reclamation that takes into account sea-level rise. 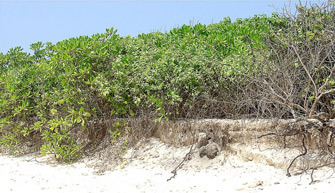 The 200 ha island of Hulhumalé, located 1 km north of the capital, for example, has been created at 2m above mean sea levels on a coral reef in the 1990s as a response to high population density pressures in the capital city (Figure 4). The construction cost were US$32 million. Figure 4. Hulhumalé island construction 1997, 2002, 2004, and 2005.